Growing your business is exciting. Getting feedback from your first customers. Watching your team expand. Moving into bigger – and bigger – spaces. But it’s also challenging, risky and downright unpredictable. You may need to rapidly tweak your product based on that initial customer feedback. You find yourself needing to restructure internally as your team begins to swell. Somewhere along the way, you may even need to pivot your entire business model to keep pace with changes in your market. Simply put, these early days of growth are a sensitive time, and one that’s highly vulnerable to disruption. It’s critical you stay in control of as many variables as possible, so you’re at peak agility when change does, inevitably, arrive. During our recent Week of Innovation in London, we heard from Chieu Cao, co-founder of fast-growth company Perkbox, who shared three reasons why a connected sales and marketing platform is a smart way to achieve that level of control. We thought we’d share those reasons with you today. One way you’ll maintain control as your business grows is by hiring – and, crucially, holding on to – the best possible people for every role. That means getting the big HR stuff right, like establishing the correct management hierarchy for your business model. But it also means empowering your star hires with the tools they need to do their jobs effectively. And that’s where a connected sales and marketing platform comes in. A connected platform can give your brightest people full, clear and secure access to your crucial business data, whatever its origin. It can allow them to quickly and easily share that data across any and all departments, while providing comprehensive, AI-powered reports and insights, and guidance on next best actions. And it can give them the flexibility to work where and how they want to work. All this adds up to a highly effective, highly committed team, and the control your business needs to navigate these pivotal, challenging days with agility and intelligence. We’ve already touched on some of the hurdles you may face as you grow and scale your business – from redesigning your products at the eleventh hour, to restructuring your burgeoning workforce. Another common stumbling block is system complexity. If you have teams working on disparate systems, teams who rarely communicate with each other, or teams with overlapping or conflicting data inputs, then what starts out as a spate of minor collaboration challenges can escalate into a major complexity crisis. This is particularly problematic since, as your business grows, you’ll likely find there are some issues you can only solve by working together, as a single unit. In such cases, quickly getting all your teams on the same page will be critical. And that means collaboration has to be seamless, even under the most challenging of circumstances. Again, connecting sales and marketing through a single platform is a vital first step. But you’ll also want to align with other departments too – notably finance – so everyone who needs to be involved is working with the same information. That’s why the Salesforce Customer Success Platform is all about integration, bringing together Pardot marketing automation and Sales Cloud, plus a whole raft of other tools to help keep collaboration as seamless as possible, however big your business grows. You’ve been collecting valuable business data from day one. As you grow, that data pool will not only increase in size, but skyrocket in value as it starts to reveal important business trends. To identify those trends you’ll need a unified view across all data sources, which – you guessed it – makes choosing a connected sales and marketing platform essential. If you’re going to make reliable, long-term predictions based on those data trends, you’ll also need to add intelligence to the mix. And ideally, this intelligent analysis will happen in the same place as your data collection – a place where you can ask big business questions and get clear, comprehensive answers that are guided by solid predictions, and specific to your circumstance. That’s why we’ve integrate Einstein, our AI function, into the Salesforce platform. So our customers can future-proof their businesses as they grow – and as Einstein gets even smarter. As we said at the start, there’s a fine line between exciting and nerve-racking. And most days, growing your business is going to be both. But you can minimise your sleepless nights by getting everyone and everything on the same page now, before it all gets too complicated. Ready to grow quickly and seamlessly? Click here for more tips on accelerating growth, courtesy of the Trailblazers at our Week of Innovation. 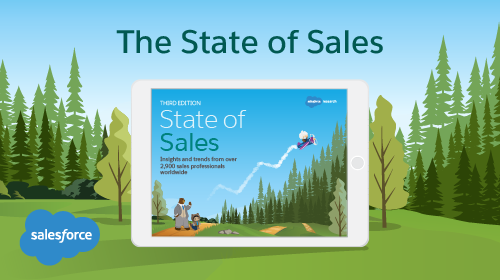 Or download the third edition of the State of Sales report to learn why data-driven sales is taking off in our latest survey of 2,900 sales pros worldwide.